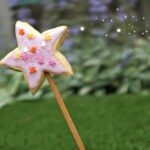 Recipe: my favourite 300g (plain flour), 200g (butter), 100g sugar) recipe! I added a yolk of an egg this time, just to really bind the dough. But it isn’t strictly necessary! 1) Mix all your ingredients. If a little dry add a yolk or an a drop of water. Normally I don’t need to, but today for some reason I did! Knead well. 2) Roll out dough about 5mm. Cut out rectangles. I did mine roughly, I think they are about 6 cm x 3 cm? 3) Carefully insert your coffee stirrers – as central as possible. If you find they poke out a little just cover them up with dough. 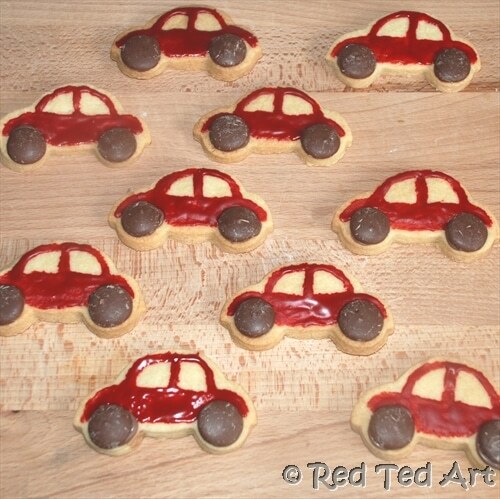 4) Cut out your cars with the cookie cutters and bake all for about 10-20min until golden. Do keep checking on them. 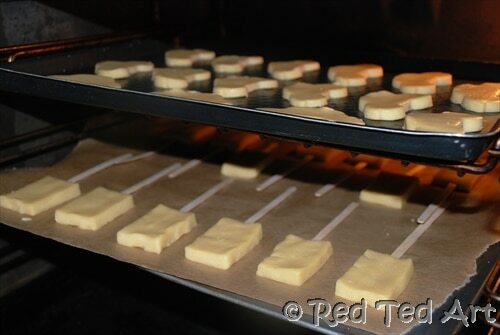 5) Let them cool slightly and then transfer to rack (a piping hot cookie is more likely to crumble). 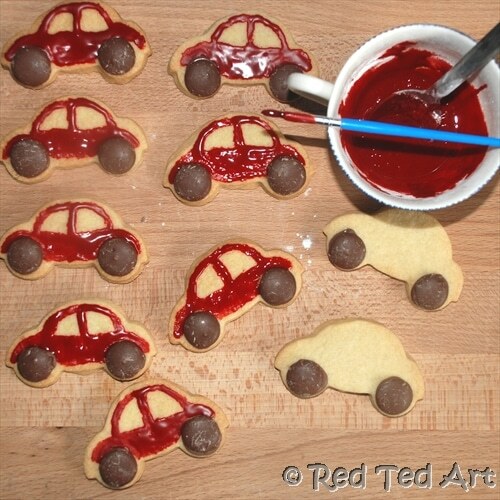 7) With the remaining hot chocolate I “glued on” chocolate buttons to the car and then added red icing with a (clean) paint brush. 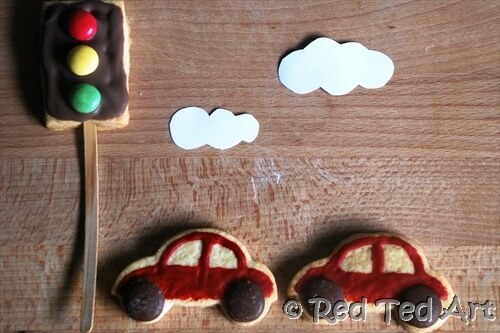 I am sure you could glue the buttons on with icing, if you are not doing the traffic lights! Sooo what do you think? 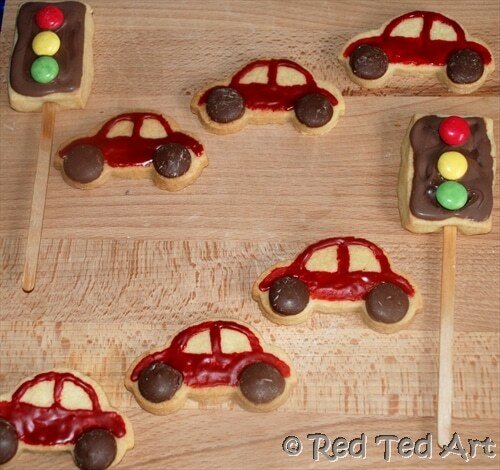 Do you think the kids at the Cars Party will like these?!? 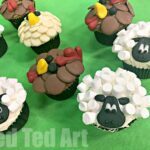 Easy Sheep Cupcakes – Farmyard Party! Wow! 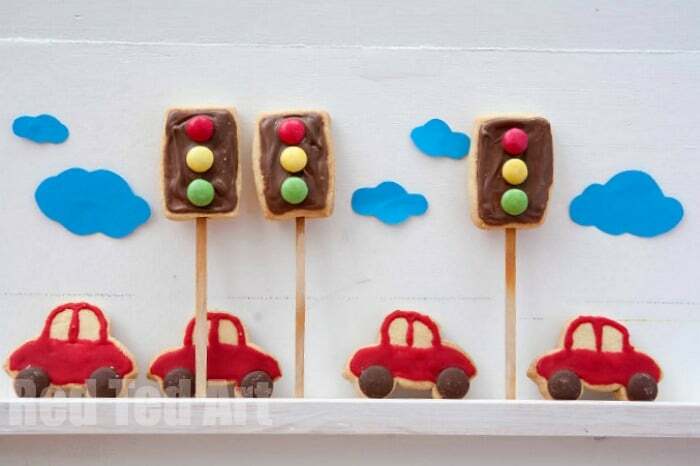 They are fab, your little one is going to be so excited! THANK YOU!! I do hope so!! Though confess, that I did just enjoy making them… so either way we win! I am looking forward to seeing how the kids decorate theirs! Thank you Isil, I think I (!) will have a lot of fun! Toot Toot! This all looks so fantastic. I would like to do this at MY parties too! Well I love them! 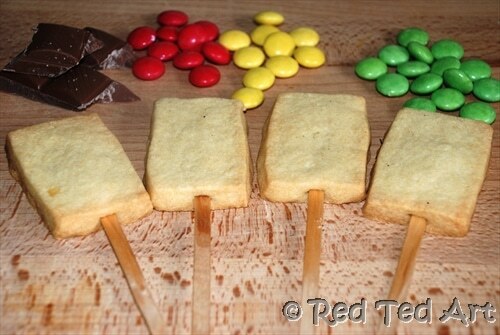 Great alternative to birthday cake! Ahem… there will be cake too!!! Absolutely fab!!!! Love, love, love!! THANK YOU ALY!! 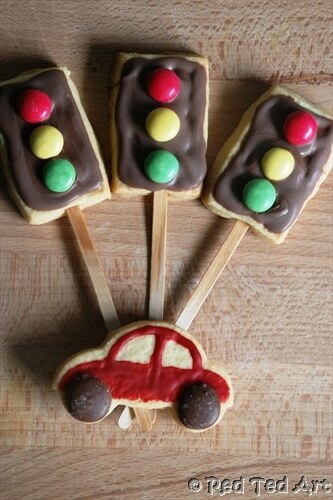 I particulalry like the traffic lights as you don\’t need a special cutter!!! You must host the coolest parties in the world! Ever. @Liz ha! I think this is a one off!!! @Cherished By Me – THANK YOU 🙂 and yes, shortbread and chocolate… that will definitely be tasty! Love them and will be pinning! Have a great party! 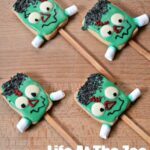 These are fantastic, my 4yo boy would be in his ultimate heaven atbyour party. He is cars mad and rarely seen without one in his hand. 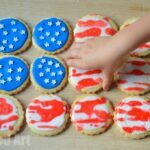 Great cookie inspiration! 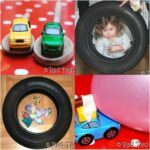 Laura – they were sooo easy and sooo satisfying to do too! Thank you and thank you for your linky party! Love love love those!!! and the party looks like it was amazing! I love the whole party stuff and can\’t get enought of it, so please keep o posting! These are awesome!!! 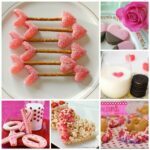 Thank you so much for linking up to Whatcha Making Wednesdays! 🙂 Have a great week! These look great! 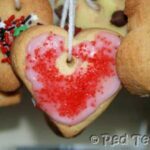 Did you use plain flour or self-raising flour for the biscuits? what is your recipe for the red icing? 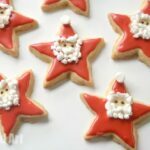 Very simply: Get Icing Sugar (the powdered sugar you get) and add a few drops of red food colouring and maybe a little water if necessary and mix to a red spreadable paste!